These directions are for instructors setting up a first time cross-over to Canvas. Login to Canvas with your faculty credentials. 2. 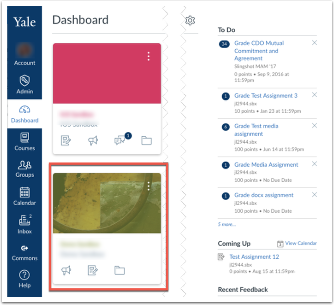 Choose the course you are teaching from your dashboard. Faculty Enlight clicking on this link will open a new window, and prompt you to sign in or create an account with FacultyEnlight. After first time pairing, every subsequent click from Canvas will not require you to sign in. Purchase Course Materials clicking this link will take your students to the campus bookstore, and prompt them to sign in or create a bookstore account to purchase course materials. The course materials you adopted will appear here in all the available formats (new, used, rental, digital). 4. Click on Faculty Enlight. You will now be redirected to FacultyEnlight. 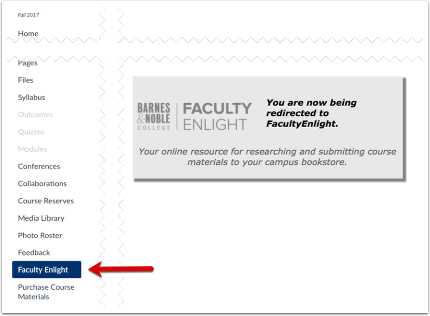 Note: Once you click onto the Faculty Enlight, you will be redirected. Please ensure that your browser has cookies enabled in order to continue with setting up this tool. 5. 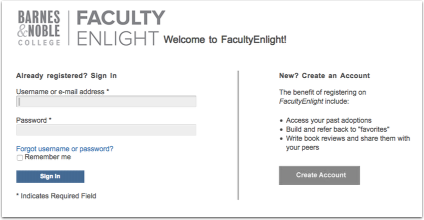 Login with your FacultyEnlight username and password, or create a new account. Your course information will auto-populate in FacultyEnlight to match the course you selected in Canvas. 6. Your Canvas account is now paired with FacultyEnlight. You will not have to log in when clicking the Research & Adopt Course Materials link from Canvas in the future. If the integration link goes down or if there is a technical error, Barnes & Nobles may be reached at the home office at LTIsupport@bncollege.com. The integration also allows for faculty and students to send messages to us if certain courses are not found. However, if the professrs have questions about FacultyEnlight or adoptions, their main point of contact would be the Yale Bookstore staff (GM321@bncollege.com) or through their online form.